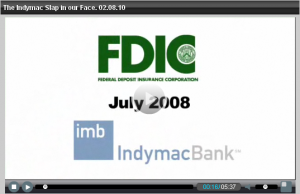 The video emphasizes what I have been saying (see FDIC Hurting Distressed Homeowners, IndyMac-OneWest Harming Homeowners and FDIC Hurting Homeowners: Case 1) about the IndyMac/OneWest Shared Loss Agreement with the FDIC. In short, that agreement is seriously hurting financially distressed homeowners and taxpayers by promoting foreclosures. To add insult to injury, as the video states, the FDIC is now going to the US Treasury to obtain more money, some of which will presumably be used to fund more crooked deals like this one. This only further my belief that the only good government is a small government. Our government is far too expensive and too big to monitor and prevent legalized theft like this Shared Loss Agreement. It is particularly infuriating that George Soros, the huge Democratic campaign contributor and main funder of MoveOn.org, is profiting handsomely from this deal via his large stake in OneWest. I thought George Soros, being the big time Democrat and huge supporter of Obama, cared about poor people? Get real. I guess it pays to buy your own president. I will look for one the next time I go grocery shopping. So much for "compassion" and "caring". It is all a lie. What a disgrace! If you are a Middle TN homeowner, property owner, condo owner, real estate investor, home builder or real estate developer who cannot pay your mortgage payments (due to losing your job, having your income reduced, illness, health problems, adverse business conditions, slow sales, loss of investment property tenants, vacancy issues, lack of funds to complete the project, feuding business partners, etc. ), know that you will not be able to pay your mortgage, have defaulted on your mortgage, are already in foreclosure, or owe more than your home is worth, please contact me to discuss your options including a loan modification and a short sale (a real estate short sale occurs when the sale proceeds are not sufficient to pay off all the mortgages and liens on the property/home). I am a Middle Tennessee distressed real estate, short sale, pre-foreclosure (preforeclosure) and foreclosure REALTOR and Expert. I primarily help sellers (homeowners, property owners, condo owners, owners of high end homes and properties (estate homes, luxury homes and executive homes), real estate investors, home builders and real estate developers) of distressed real estate, short sales, pre-foreclosures, foreclosures, investment properties, failed new construction projects and struggling commercial real estate developments located in Middle Tennessee (Rutherford County TN, Williamson County TN, Davidson County TN, Robertson County TN, Maury County TN, Murfreesboro TN, Smyrna TN, La Vergne TN, Eagleville TN, Lascassas TN, Rockvale TN, Christiana TN, Brentwood TN, Franklin TN, Nashville TN, Belle Meade TN, Nolensville TN, Spring Hill TN, Gallatin TN, Springfield TN and Mt. Juliet TN). If you do need to short sell your home or property, or you need a quick sale due to being in foreclosure, you can request short sale and foreclosure help and assistance on my website at Get Short Sale and Foreclosure Help and Assistance from a Nashville Tennessee and Middle Tennessee Short Sale and Foreclosure REALTOR and Real Estate Expert.